Eobot is an online platform where you can earn money with investment by investing in cryptocurrency, and without investment by claiming from the faucet of the site . Eobot is one of the few investments sites that are online since 2013 , on this site you can mine crypto currency without depositing any dollar . In addition, this platform offer a free 1 doge coin everyday for your connection. Also this cloud mining platform own a faucet that offers you an amount of a crypto currency every hour . BTC Bitcoin, LTC: litecoin, BLK: BlackCoin NMC: Namecoin, DOGE: Dogecoin, XRP: Ripple, DASH, RDD: Reddcoin, BTS: BitShares, CURE CureCoin, XEM, XMR: Monero, VOX voxels, XLM: Lumens, BCN: Bytecoin, PPC: peercoin, MAID: MaidSafeCoin, ETH: Ethereum, RCMP Gridcoin and the CTF: Factom. Cloud SETI, Cloud Folding, Cloud Mining (GHS 3.0, GHS 2.0 and MHS). you can purchase this service of cloud mining using crypto currency or paypal As they may be purchase for a period of 24 hours, a year or 5 years depending on your choice. Ccminer for Nvidia GPUs (SHA256, Scrypt, X11) . Sgminer for AMD / Radeon GPUs (SHA256, Scrypt, X11) . Cpuminer for CPUs (SHA256, Scrypt, X11). Eobot show an internal calculator to estimate the earning for each exchange transaction or purchase .the minimum deposit is: 0.0001 BTC, LTC 0001 / DASH, 0.01 BLK / NMC / CURE / ETH, 0.1 XMR, XRP 1 / PPC / MAID, 10 RDD / GRC, DOGE / BCN. You will earn 1% on all the investments and the earnings of your affiliates . The minimum of deposit is 0.001 BTC, 0.2 LTC / DASH / ETH, 1.0 NMC / CURE / PPC, 10 BLK / XRP / XMR / NXT / FCT, 100 DOGE / XLM / VOX / MAID / GRC, 1000 BTS / XEM / , 10000 RDD Manual and automatic limited to 5 payment per day. 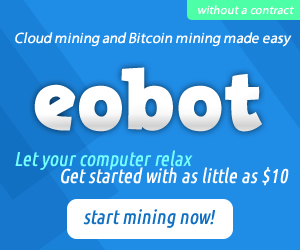 Eobot is one of the best site to make money using clou mining and to earn freee money .